The last quarter of school began with an all-school prayer service in the Our Lady of the Sioux Chapel. Each quarter, we recognize individual students who set an example of cooperation and service for classmates to follow. At the end of the year we will select one student from the group to receive the Leo John Dehon Service Award. Fr. Dehon founded the Priests of the Sacred Heart based on the values of justice and love. Today, 21 students came forward to receive a certificate and encouragement for their efforts. – How to handle restrictions and consequences when students misbehave. – The goals, highlights and changes we expect from our new strategic plan. – The opportunities and temptations about how our students are using technology. – Update on our Iye Tokéya Inájiŋ – They stood here at the beginning – Alumni and History center. – Creating public service announcements and video spots to help people know about the programs St. Joseph’s has available for families and students. Three of the members have served on the committee for 5 years now, and we recognized their contributions by giving them one of our blue fleece St. Joseph’s jackets worn by staff. I went to the doctor for a follow up visit from my recent hospitalization. Everything checked out OK. He told me to keep doing what I’ve been doing, and try to gradually increase the exercise. I joined Fisher Home (6th-8th grade boys) for supper. The big topic of conversation was whose favorite teams would win the NCAA basketball tourney. There are no regional college favorites among our students but, like many kids, they tend to get on the bandwagon for winners. I grew up in Indiana and am cheering for the Hoosiers, glad to be back in the mix. The boys had a great time in Washington, DC. Each spring we have a donor-sponsored trip to Washington DC that allows a few of our students to experience the Smithsonian’s American Indian Museum. Alex, Trey and Gabriel spoke about some of their favorite sights, with the White House on top of the list. It was Gabriel’s first visit to a large city, and he couldn’t get over the crowds everywhere. 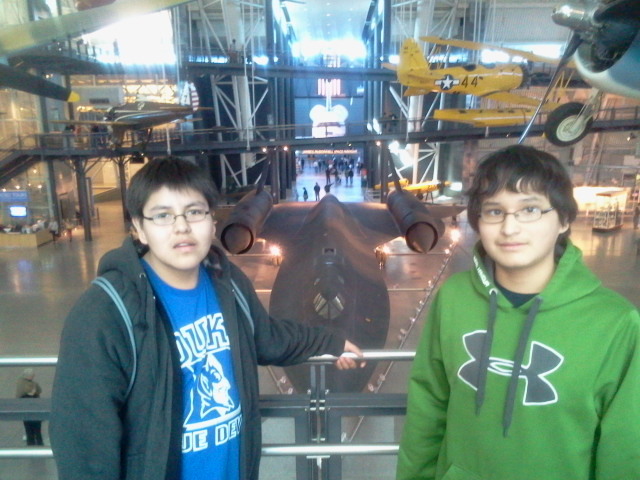 The boys got an appreciation of the many different tribes that are represented at the museum,and government and history became more concrete and real for them in what they saw and experienced. I love that museum. I still vividly remember my trip there when I was about their age.